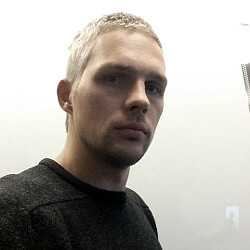 Dealbeaver is the PUP that uses misleading techniques to prevent removal. Use Reimage to locate malicious components and get rid of them faster than with uninstall instructions. A full system scan blocks virus reappearance and prevents traffic to malicious domains. Dealbeaver ads - should you consider them dangerous? How does this ad-supported program spread and how does it manage to get inside the computer system unnoticed? Dealbeaver ads – should you consider them dangerous? Have noticed a suspicious button in your browser menu bar, displaying DB letters? If so, it probably means that your PC is infected with Dealbeaver virus. 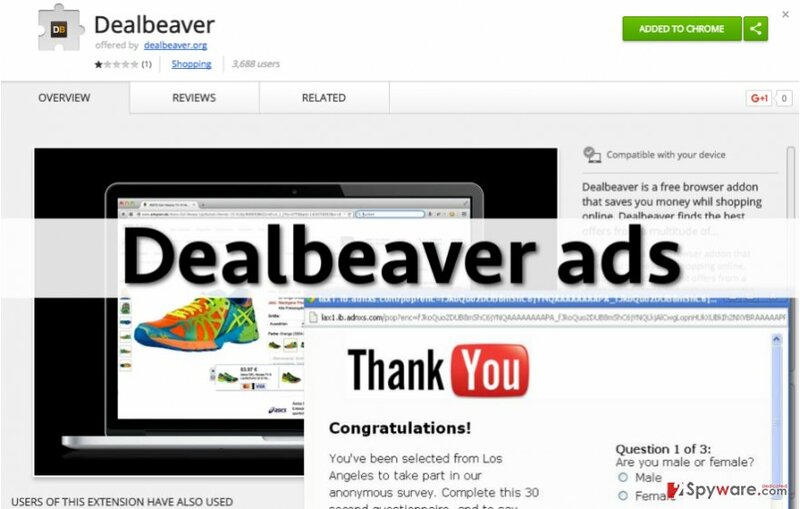 Besides, you probably have also noticed annoying web ads that appear in pop-up windows and new tabs, claiming that they are powered by Dealbeaver. If you are sure that you did not install this program by your choice, it means that you have accidentally downloaded it alongside other free programs, and gave it permission to hijack your computer. There are some reasons why we consider these ads untrustworthy and recommend staying away from them. These ads have only one target – to redirect users to sponsored sites, and get paid for users’ visits. Such monetization method is also known as a pay-per-click advertising model. It is better to keep your PC free of ad-supported programs that advertise various third-party websites because some of these ads might be untrustworthy. They can make you explore dangerous websites, which seem secure at first sight. Just to be sure that your PC stays safe, avoid clicking on these ads, and especially stay clear of sites that suggest updating your programs or installing new ones. Chances are, you might be tricked into installing malware! You probably wonder why these ads look so attractive and provide deals and discounts for items or services that you are interested in. The answer is quite simple – Dealbeaver adware collects non-personally identifiable information, such as clicks, IP address, browsing history, search queries, downloads, browser type and version, operating system used, and similar data. Based on all information it collects, this adware selects the certain set of advertisements by third-parties and starts displaying them for the user. As we have already mentioned, these ads might be untrustworthy, and that is why the decision to remove Dealbeaver might be the best in this situation. You can start the removal procedure manually and, if something does not go right, finish it automatically. To complete Dealbeaver removal, we suggest Reimage software. Below, you can find a detailed removal tutorial explaining how to remove Dealbeaver virus. After completing instructions provided below, you will forget about annoying ads and inconveniences they cause (such as system slowdowns, interruptions and so on). It is important to complete Dealbeaver removal as soon as possible because this program can make your PC vulnerable to other infections. Besides, its functionality is hardly trustworthy, and we doubt that it can help you to save money while shopping online. Look through the computer system for files and programs related to Dealbeaver. Follow provided instructions and remove them. Here, look for Dealbeaver or any other recently installed suspicious programs. Check your apps and every web browser for Dealbeaver and related components. Wait until you see Applications folder and look for Dealbeaver or any other suspicious programs on it. Now right click on every of such entries and select Move to Trash. When in the new window, check Delete personal settings and select Reset again to complete Dealbeaver removal. Once these steps are finished, Dealbeaver should be removed from your Microsoft Edge browser. Here, select Dealbeaver and other questionable plugins. Click Remove to delete these entries. Now you will see Reset Firefox to its default state message with Reset Firefox button. Click this button for several times and complete Dealbeaver removal. Here, select Dealbeaver and other malicious plugins and select trash icon to delete these entries. Click Reset to confirm this action and complete Dealbeaver removal. This entry was posted on 2016-09-08 at 00:00 and is filed under Adware, Viruses. You can quickly scan the QR code with your mobile device and have Dealbeaver ads manual removal instructions right in your pocket. How did you remove Dealbeaver ads?